In competitive markets where customer loyalty can easily be lost through poor service, the performance of call and contact centers is vital. The Red Box Quantify voice, data and call recording solution helps organizations raise service levels while reducing operational costs. Not only does this powerful software suite record calls for fact verification, dispute resolution and analysis of customer interactions, it also enables service quality and agent training needs to be assessed for workforce optimization. The ability to record and quickly replay incoming, outgoing and internal calls is a key feature for call and contact centers that want swift access to information for fact verification and dispute resolution. 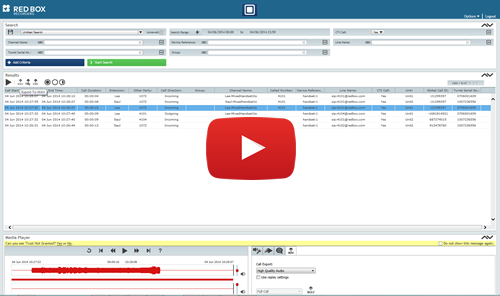 With Quantify Search and Replay it’s easy to listen to recorded calls by performing custom searches based on data such as date, caller name and number. And when you’ve identified a recording that you want to replay, listen to it using Quantify’s built-in Media Player. To deliver high-quality service at all times, organizations need to train agents to the right level, and reduce employee churn by keeping those agents engaged. Retaining employees can be key to reducing recruitment and operational costs so it’s important to keep your workforce motivated and feeling valued. Red Box Quantify gives you tools to help you improve skills and moral throughout your organization by recording calls and providing a way to assess employee performance and deliver personalized coaching and training. With Quantify QM’s built-in scheduler, managers and team leaders can automatically – on demand or on a daily, weekly, or monthly basis – retrieve and listen to calls for pre-selected or random agents. Calls can then be evaluated against pre-set or custom questions and once an area for improvement is identified, a coaching session can be created and agent-specific objectives assigned. When an appraised employee logs in to QM, they can review their evaluation and provide notification of when set objectives are achieved. For contact centers that record communications but handle card payments, compliance with PCI DSS security standards is vital. PCI regulations do not permit storage of sensitive authentication data such as CAV2/CVC2/CVV2/CID information and failure to comply could result in a large fine. Red Box’s solution for PCI compliance works by suppressing payment details from call and screen recordings and can be triggered both automatically and manually.